Could there be an option to generate ores in large uncommon veins similar to how TFC did? Great mod! Support for Advanced Rocketry would be wonderful. What about Support for Galacticraft? Also, are you planning on updating this mod in the future? This love this mod! However, it has a problem with "morb" form "Thermal Expansion". It makes morbs useless if it hit nothing or crafted into "reusable morb". Using last version of the mod and getting crushed on intering in the end dimension. Also disabled the end world gen.. but keep on getting same issue. I get this error on startup after messing with the config, I don't know what it is. perhaps also post the config? Gonna test it for a bit, if what I disable keeps breaking, Im probably just gonna stop trying to use this mod. hmm I haven't disabled anything. The mod is quite great, would like to see more config options for nether and end. OreGen is a beast, unfortunately it isn't that easy as most mods don't explain their ore congfigurations. I disabled all the generation to use the superior COFH World, but it doesnt seem to like being disabled. And the Gears and rods and such. You can ignore gears and rods I think, I don't have any of them even if enabled. Same goes for dusts, on the other side I also use Pulver. (my next modpack has to be more streamlined). Let's wait and see what the mod developer says. b) while I know that this is for your own modpack try to keep an open mind. It is a really great mod after all. I have an issue with 0.1.0.32 atm: I don't get any dusts, gears etc also Iron Ore etc still spawns quite often and smelting it results in an ingot (found the issue for that, orespawn, removed it). Is the dusts, gears etc not showing a bug? Would you be able to make the biomes in which specific ores are more abundant configurable per ore and allow for using modded biomes? The mod is compatible with Ic2 Classic? After installing this mod the game crashes at startup with Ender Io fatal error screen.As it never happens before,i guess the reason is that config you mentioned in "known issues". [main/ERROR] [enderio]: things to vanilla items or the Ore Dictionary. P.S. 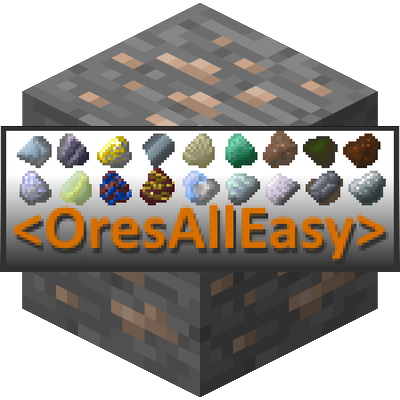 Almost every mod in modpack is the latest version.Ender Io and Oresalleasy certainly are. P.P.S. Is there a compatibility with Magneticcraft? Is there compatibility with The Betweenlands?